Dorion is the fortunate husband of Doraine and father of Austin. He considers it an honor and a privilege to serve as the Youth Pastor of All Nations Apostolic Tabernacle in Jamaica, NY, where the Rev. 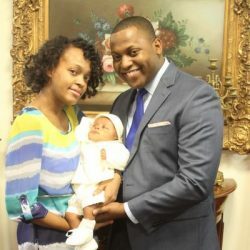 Devon Dawson is Pastor. Dorion has worked in various capacities in youth ministry since the age of 16. He also teaches the Teens Sunday School class and has done so since 2009, most recently serving as lead teacher. Dorion holds a B.A. in East Asian Languages and Cultures from Columbia University in the City of New York, and an M.S. in Electrical & Computer Engineering from the New York Institute of Technology. He enjoys spending quality time with family, traveling both near and far, and reading a riveting non-fiction book or two (or three). In 2015, Dorion was elected as New York Metro District Youth Secretary.